Metal oxide semiconductor gas sensor has the advantages of low cost, high sensitivity, easy control and operation. It is widely used as a functional device in gas sensing, photocatalysis, solar cells and so on. At present, tungsten oxide (WO3) is considered to be superior to ZnO, SnO2, and TiO2 in semiconductor metal oxide gas sensing materials for high efficiency detection of NOx. Step 1: Deposit tungsten thin film material layer: Place monocrystalline silicon in the vacuum chamber of an ultra-high vacuum magnetron sputtering facility. Deposit tungsten thin film material layer on the surface of monocrystalline silicon using tungsten metal as target material and argon as sputtering gas. The gas flow rate of argon is 30-45 sccm, the sputtering working pressure is 1.8 Pa and the sputtering power is 1.8 Pa. The rate is 90-95W, the sputtering time is 15min, and the purity of tungsten is 99.999%. Step 2: Crystallization of one-dimensional tungsten oxide nanowires: The tungsten films prepared in step 1 were recrystallized in a vacuum high temperature tubular furnace. The growth atmosphere was a mixture of oxygen and argon. During the growth of tungsten oxide nanowires, the oxygen and argon flow rates were controlled by controlling the oxygen and argon flow rates of 0.2-0.4 SCCM and 36-38 sccm, respectively. The growth gas pressure in the tubular furnace is 160Pa. The tubular furnace rises from room temperature 20-25 to 650-680. The heating rate is 4 C/min. The temperature is kept at 650-680 ℃ for 1.5 hours. Then the temperature is lowered from 0.5 hours to 350 ℃. Finally, it is naturally cooled to room temperature 20-25. The growth atmosphere is a mixture of oxygen and argon. The flow rates of oxygen and argon are 0.3-0.4 SCCM and 36-38 sccm, respectively. The pressure in the furnace is about 160Pa. Step 3: Annealing of one-dimensional tungsten oxide nanowires: The one-dimensional tungsten oxide nanowires fabricated in step 2 were annealed for 1.5 hours in a muffle furnace at 32-380 ℃ in air to ensure the proportion of oxygen in the nanowires. Annealing treatment can promote the full oxidation of the incompletely oxidized components in the tungsten oxide nanowires prepared in step 2 to further stabilize the orientation. Step 4: Copper plating on the surface of the annealed tungsten oxide nanowire: depositing a copper film on the surface of the one-dimensional tungsten oxide nanowire substrate treated in step 3 by ultra-high vacuum on the target magnetron sputtering, using copper as a target, and argon gas As the sputtering gas, the flow rate of the argon gas was 40 sccm, the sputtering working pressure was 1.6 Pa, the sputtering power was 88 W, and the sputtering time was 0.5 min. Step 5. Annealing heat treatment of copper: the substrate prepared in step 4 is annealed in a muffle furnace at 400 ℃ for 1.5 hours to promote oxidation to synthesize copper oxide shell. Step 6: Platinum electrode layer: Platinum is plated on the substrate made in step 5. Two electrodes with a spacing of 1-2 cm and a size of 2 mm*2 mm are formed on the tungsten oxide/copper oxide core-shell hetero-nanowire array by template method. The ohmic contact between the electrodes and the nanowires on the silicon surface is formed. Platinum is used as the target material and argon is used as the working medium. The sputtering time is 2min and the thickness of the electrode is 80-120nm. Pure tungsten oxide nanowires detect nitrogen oxides with high working temperature and low sensitivity. Pure tungsten oxide nanowires have the highest sensitivity to 1ppm NO2 gas at 4.1 150. The gas dynamic response of the prepared core-shell heterostructure sensor to 1-5 ppm was 5.88 at 50 ℃, the optimum working temperature was 50 ℃, and the sensitivity was 7.32. The nitride oxide of PPB grade could be detected. 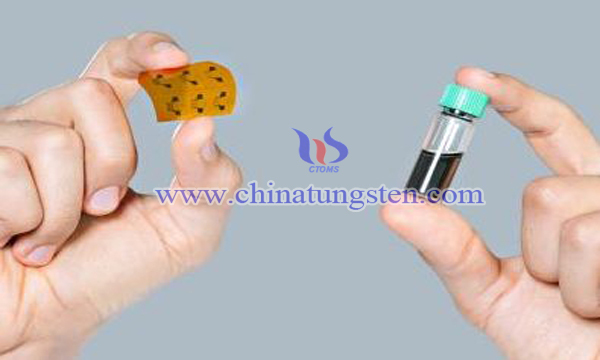 Compared with the pure tungsten oxide nanowires, the optimum working temperature was 150 ℃ and the maximum sensitivity was 4.3.